Lindholm Høje is just north of the Liim Fiord near Ålborg. 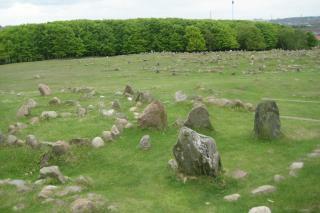 It is one of Denmark's most spectacular grave sites from the Iron Age and Viking era. At least 700 burials took place on the burial ground from the mid-5th century and 500 years on. Most interesting are the 350 or so cremation graves marked out with stone borders. Everywhere you can see triangular, square, round and oval stone borders. There are 140 set out in boat shapes, with pointed bows and sterns. These boats sailed the occupants to the land of the dead. One autumn day in the 10th century – the middle of the Viking era – the west wind came roaring through the Liim Fiord. It carried huge amounts of sand in over the fields at the foot of Lindholm Høje. When archaeologists excavated the site 1,000 years later, they found clear traces of a desperate peasant and his horse who tried to flee from the raging elements. It was not the first time a stand storm had hit the site. Several times in the Iron Age the wind had whistled across the open areas leaving thick layers of sand behind. Even while the burial ground was still in use, the oldest graves were covered with drifting sand. Under the sand, archaeologists also found traces of old roads and farms, some of which date back to the time of the burials.